Israel – Dead Sea Tour – Ryans-Air-Adventures! Towards the end of 2012, I was hanging out at the ‘Gomio World Hostel Conference‘ in Jerusalem. As I flew in a few days prior, I managed to meet a few of the other early arrivals and check out the sights of Israel. You cannot go to Israel and not see the Dead Sea! I remember being a young boy in Australia, hearing about tales of my friends parents floating on ‘magic’ water while on holiday… with water so salty it stung the eyes… and mud so rich in minerals it soothed the skin. It’s one of the sights that has been on my bucketlist for the longest time, so I was wrapped to finally get the opportunity. The Dead Sea is the lowest spot on the face of the earth, and a natural health spa. Abrahams do a half day tour, which was a popular option for many delegates – a great half day escape! Trading in the cold start of winter in London for a warm sunny Dead Sea experience was definitely a highlight of the trip. Abraham’s Tour Bus takes you there and back, it’s an easy cheap option… you take a lunch or can buy snacks there. The driver doubled up as a bit of a guide and told us a few tales of Jerusalem, the Gaza Strip and points of interest along the way – including the Mount of Olives and its churches. 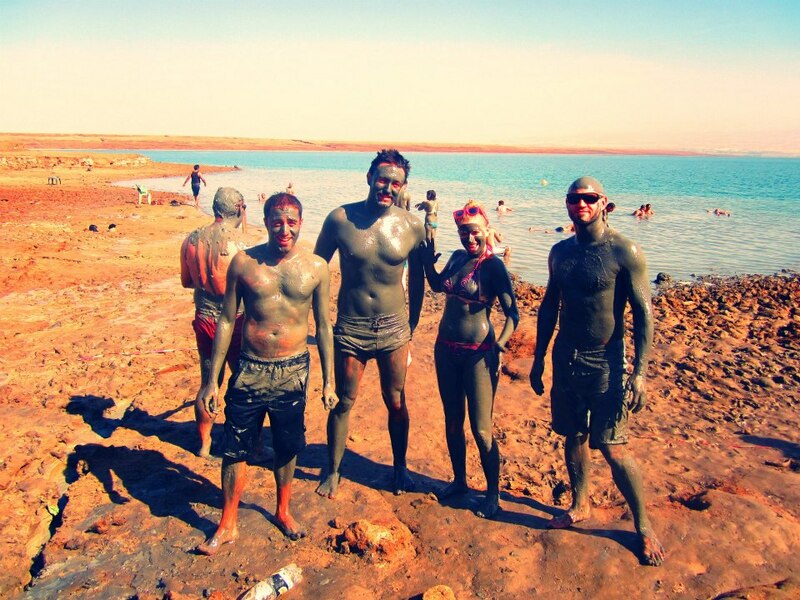 The drive isn’t too long (40mins) and once there, it’s pretty much free time to lounge in the sun, have some mud fights and float in the Dead Sea! I definitely recommend to swim out over the rope buoy barriers and into the lake properly, as you really do get a better outlook as to just how big the area is. You can even see the bordering country – Jordan… and its tourists enjoying the same day you are on the other side of the lake. The lake is huge and we saw just one small part of it – nothing fancy, just a chilled spot with minimal fuss…. it was kind of ‘non touristy’ in a way – no built-up hotels or health spas where we were, which made the experience seem a little more natural, as mother nature intended. The Dead Sea is 3 million years old. Water flows into the Dead Sea from streams and rivers, but does not flow out. The climate of the Dead Sea region is sunny, warm and dry all year round. The minerals in the Dead Sea all naturally occur within our bodies. The unique salt in the Dead Sea treats acne, psoriasis, hives, cellulite, dry skin, dandruff, stress & muscle aches….and much more. I had a great time in Israel and only wish I could have spent more time checking out the rest of the country, its sights and some kibbutz’s. I did mange to get across the border to Jordan to see Petra too… but I will leave that for another post! This entry was posted in Backpacking, Budget travel, Holiday ideas, Hostels, Travel, Travel Tours and tagged abrahams hostel, abrahams tours, dead sea, dead sea facts, dead sea tours, easyjet, gomio, Gomio World Hostel Conference, israel hostels, israel sights, jerusalem day trips, jerusalem tours, ryan bennett, ryans air adventures, see the world for less. Bookmark the permalink.